There are very few things in life that are better on a hot day than a cool serving of zaru soba. This recipe brings me to the last installment of the Japan segment of my East Series (What!) which is pretty damn exciting. The next segment I’ll be featuring is China, where I’ll be exploring some delish Chinese recipes. But first, let’s talk about this nourishing noodle dish. A lot of East and Southeast asian dishes call it like it is when it comes to names, and Zaru Soba is no exception. A zaru is a bamboo tray or basket used to drain the noodles in the preparation and presentation for this dish; soba, of course, is the type of noodle. Soba translates to buckwheat, but it’s most commonly used in reference to soba noodles in Western cultures. Despite the fact that most mainstream supermarkets carry soba noodles in their “International” aisle, I highly recommend hitting up your local Asian markets instead. You’ll get the best quality of soba noodle there, and if you can get your hands one soba noodles that are 80 per cent buckwheat (hachiwari soba), do it. Not only are these noodles more delicious, but they also pack a nourishing punch. The most traditional way to present zaru soba is to set the soba onto the zaru and over a plate to catch any excess water that might drip. These bamboo trays are sold at Asian markets and craft stores. But if you don’t have access to one, don’t fret. The flavor of the dish won’t be affected. If you’re a foodie, you’re already aware that there is NO shortage of soba dishes out there. They’re extremely versatile and range from hot to cold — though the one that seems to rank highest in popularity here in the US is, of course, the cold soba noodle salad. Don’t quote me on this, because I don’t know for sure, but I’m convinced that zaru soba *might* be the pioneer of this concept. Unlike it’s derivatives, zaru soba is simple AF: chilled noodles, a cool mentsuyu for dipping, some sliced spring onions, and a dab of wasabi (optional) to kick things up a notch. With the impending sizzle of summer here in North Carolina, this dish is undoubtedly going to become a go-to in this house. It takes a measly 10-15 minutes from start to finish, and you don’t have to worry about heating up your kitchen. Long day working out in the garden? Zaru soba. Laborious day laying patio stones out in the scorching sun? Zaru soba. Chill day by the pool? Still, zaru soba. Mentsuyu (Dipping sauce; this recipe makes 1 cup concentrated mentsuyu; you can also skip this and use storebought mentsuyu from your local Asian market). In a medium saucepan, bring sake to a boil over moderate heat. Let the alcohol evaporate; this will take about 30 seconds. Add the soy sauce, mirin, kombu, and dried bonito flakes (katsuobushi). Cook soba noodles according to the package instructions. (Note: don't add salt or oil to the water like you would for pasta). Occasionally stir the noodles to ensure they don’t stick to one another and check on the tenderness; don't not overcook them. Sometimes they are done earlier than the package instructions. If that's the case, remove them when you feel they are done. Strain the noodles and run under cold water for a few seconds while tossing the noodles around with your hands to not only cool them, but to also remove starches. Give the sieve a good shake to rid of excess water. You can leave them in the sieve while you prep your garnishes, or you can submerge them into an ice bath set up in a large bowl until the noodles are cool. I tend to just let the noodles sit since I give them a good and thorough rinse through cold water anyway. Place bamboo mats or sieves over a plate. Place soba noodles over the mats and garnish with shredded nori. In a small bowl, combine equal parts mentsuyu and water; stir to combine. Distribute the mentsuyu into small individual bowls and serve alongside noodles, a small bowl of sliced scallions, and wasabi (optional). 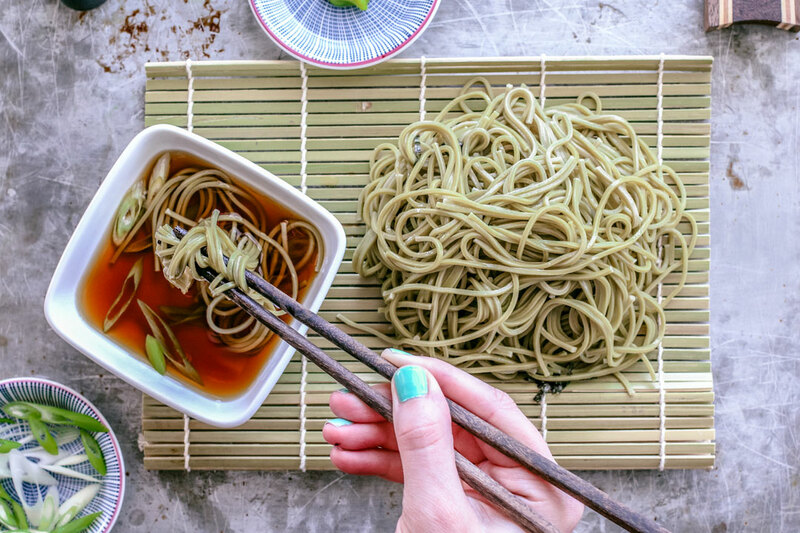 To eat, simply grab soba noodles with your chopsticks, dip into mentsuyu, and slurp away. You can mix wasabi into your dipping sauce, and add scallions as you see fit.